A few months ago, I had the great pleasure of spending some time chatting with Dr. Roslyn Walker, the DMA’s Senior Curator of the Arts of Africa, the Americas, and the Pacific. In the course of our discussion, she told me about an event that occurred in 1881 called the “Golden Axe Incident.” The Asante People of Ghana sent an official delegation to the British-controlled Cape Coast because a refugee from their city had fled there to claim British protection. The Asante arrived to demand the refugee’s return, bearing a ceremonial Golden Axe. The British interpreted the axe as an explicit symbol of warfare, and suddenly, the threat of war loomed much to the Asante’s surprise. Only when the Asante later sent their most experienced official to deliberate was the Golden Axe’s meaning clarified to the British authorities: the axe symbolized the desire to cut away all the blockages on the path to settlement–it is, essentially, a diplomatic symbol. I was fascinated by this story, because it shows how the misinterpretation of the cultural meaning of an image–its iconography–nearly resulted in war. Iconography is about explaining what symbols and imagery in a work of art meant to people at the time of its creation, understood through careful research into the historical context of not just that artwork, but a culture’s visual language. And while iconographic misreadings are usually not this fraught, I confess to sometimes feeling wary of how to present such information while teaching in the galleries. Iconography is privileged knowledge. It is usually only understood by experts after laborious study, research, and careful analysis. Such knowledge is part-and-parcel of art historical practice, but can be tricky in gallery teaching. As Rika Burnham in Teaching in the Art Museum attests, iconographic information is often exactly what audiences and students are seeking, and offers momentary insight and relief, but usually stops any discussion or further analysis. And in many ways, this is what iconography is meant to do–it’s not our cultural or individual interpretation of what a symbol means, it’s what it meant at the time of creation. This can be a difficult set of knowledge to tease out through discussion, although by no means impossible. But when to introduce iconographic information during the course of learning? Ideally, the need to raise what certain symbols and images meant is prompted organically in the course of a discussion, but how much information should the teacher offer? If we open the floodgates, pour forth all the information we know for every symbol, we risk that sense of closure and discovery we want to carefully allow students to explore on their own. If we offer too little or carefully selected iconographic details, we risk, at the very least, presenting a stilted understanding of what the artwork might have meant historically. I was thinking of these questions when standing before Jean Marie Reignier’s Homage to Queen Hortense, featured in the Museum’s new special exhibition, Bouquets: French Still-Life Painting From Chardin to Matisse. 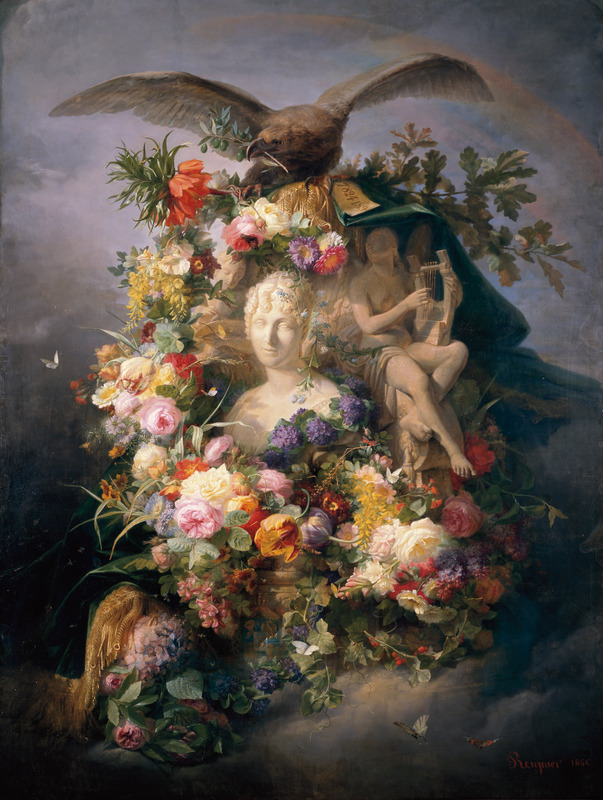 As part of a beautiful exhibition of floral still-life, this grandiose painting stands out (it’s nearly seven feet tall and five feet wide): a lush garland of flowers surround a sculpted bust of Napoleon III’s mother, Hortense, atop which sits an eagle bearing an olive branch. These details–the portrait bust, the eagle, the olive branch–as well as the scale of the painting tantalize us that despite the floral imagery, something else is going on here. For me, it would be easy in the context of the exhibition to dismiss these and focus on a comparison of this with the other floral still-lifes in the exhibition…If it were not for the seemingly unavoidable depiction of a paper label at the upper right bearing the number “7824189,” placed just under the eagle’s left talon. This numerical notation must have a specific meaning, right? Thus we begin down the rabbit hole of the complex iconographic meaning imbued in this painting. Some symbolism here is relatively common, such as the olive branch as a symbol of peace. As the mother of the leader of France at the time (Napoleon III came to power in 1852), this homage to Hortense is rife with political and personal symbolism, ranging from the inclusion of red tulips (at the upper right) as symbolic of Hortense’s title as Queen of Holland and violets and bees (towards the lower left) as Napoleonic symbols, to the palette held by the figure (to the left behind the portrait bust) as indicative of Hortense’s own practice as a floral painter. And that number? It is supposedly the number of votes cast for Napoleon III in the election, securing his victory and rightful leadership of France. I’ve learned all of this iconographic meaning from a wonderful series of lectures and trainings Dr. Heather MacDonald, the DMA’s Lillian and James H. Clark Associate Curator of European Art, has offered to the public, staff, and docents since the exhibition’s opening. And the symbolic understanding of Reignier’s painting offers a wealth of insight into aspects of how imagery worked as political propaganda in France at the time, even as this painting avoids many of the traditional symbolic tropes common to floral painting up to this point in history (the memento mori and cycle of nature suggested by wilting flowers, for instance). It is also helpful for understanding the intentions behind this painting: as a “statement” painting, this artwork was meant to elevate floral imagery to the same level as other academic painting approaches that relied on the human figure. The “privileged” nature of iconographic meaning is a slippery slope in gallery teaching. And while I don’t think every painting that is iconographically rich necessitates a discussion of such iconography when teaching in the galleries, I can’t help but feel that here, that tag with painted number on it, likely forces an educator’s hand while teaching before it, or a painting like it. How do you handle iconographic analysis when teaching in the galleries or your classrooms? Leave tips, thoughts, and feedback in the comments below!